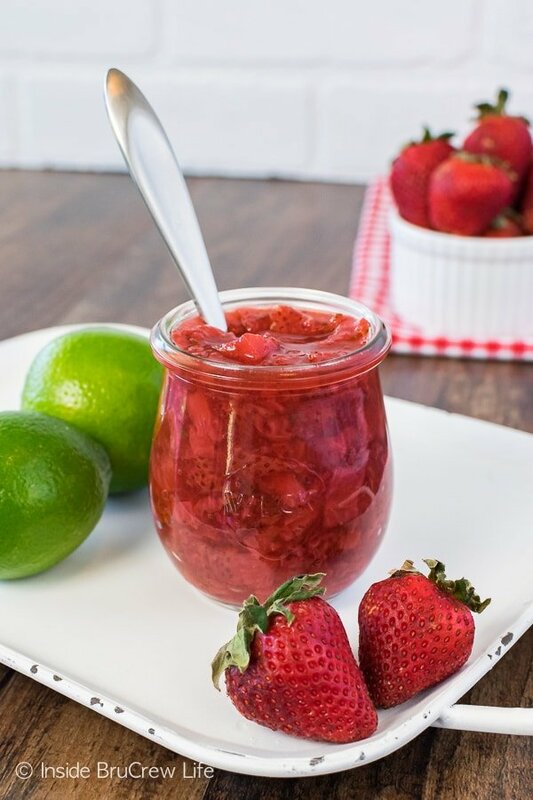 Keep a jar of this easy Honey Lime Strawberry Sauce in your fridge this summer. 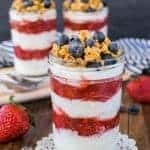 It is the perfect fruit topping for ice cream, waffles, or cheesecake. We are officially on summer break here. Bring on all the sleeping in, picnics, pool days, and late nights that come once school is out. We don’t have too many plans this summer. I know a week at the beach is definitely going to happen, and lots of trips to Six Flags. Gotta get our money out of that season pass, right? At least that’s what my daughter says anyway. The old person in me just wants to stay as far away from those twisting upside down rides as I can. I can remember going on roller coasters all summer long as a teenager, but I can’t handle them at all now. My equilibrium has definitely aged. LOL! But other than that, we will probably just be relaxing and enjoying the lazy days in our backyard. Eating lots of fruit and drinking pitchers of sparkling key lime fruit punch sounds like the perfect plan for those days. Fresh strawberries really don’t stand much of a chance in our house. 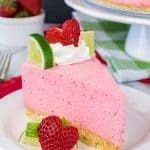 Either the fruit monsters…aka the children…eat them immediately, or I turn them into a fun dessert like this no bake strawberry daiquiri cheesecake. There is something about a strawberry that takes me back to when I was little. My mom always took us strawberry picking when we were younger. Although I’m not sure much picking by the kids ever happened because I remember eating almost every single one I picked. I mean, how can you resist a warm juicy berry fresh out of the field? They are so good that way! Fast forward a few years and I used to take our three kids to the strawberry patch every spring/summer to pick berries. Yeah, I was the only one filling up the buckets because the kids were all too busy munching on berries to help me. I guess that’s how it goes for a mom in the strawberry patch with kids, right? 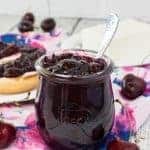 A few years ago I made this honey blueberry sauce. 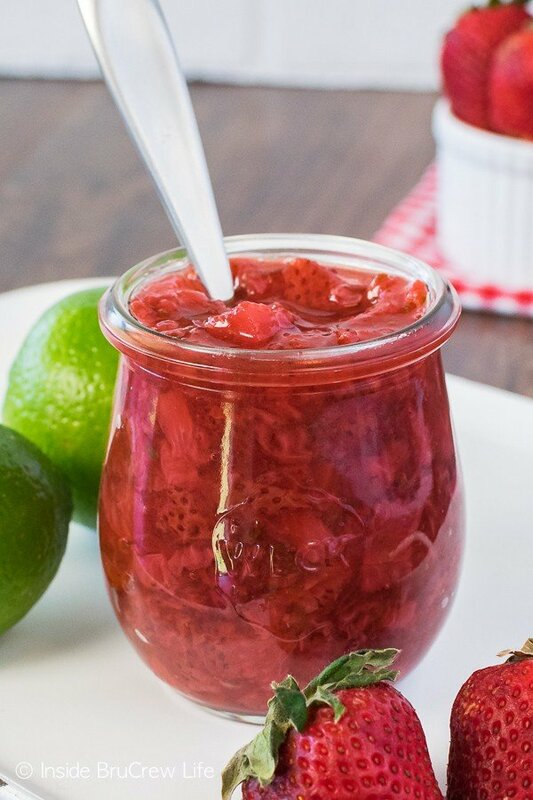 It’s an easy three ingredient way to have homemade pie filling without all the preservatives. So this year, I decided to do the same thing with a box of strawberries. And since I’m on a lime kick right now, I added some lime zest to the warm sauce. 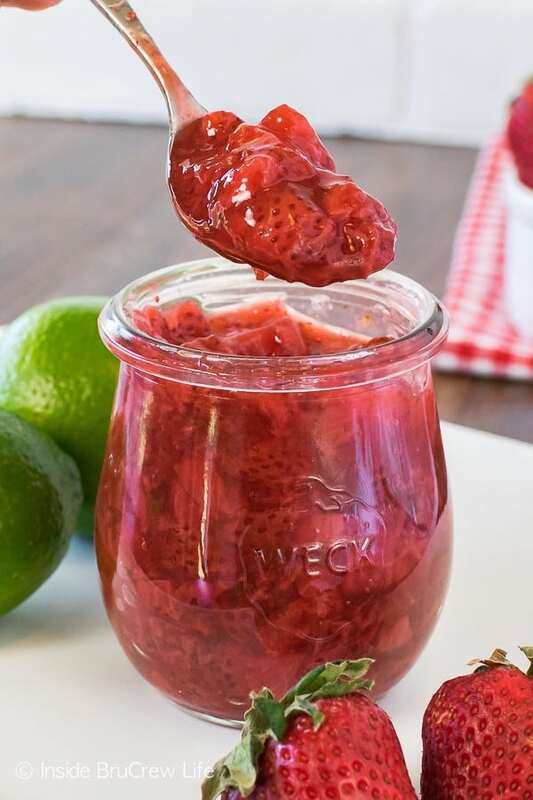 I recommend having a jar of this honey lime strawberry sauce in your fridge at all times. You can use it on so many things. 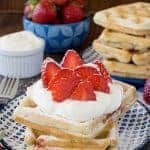 It’s perfect on a bowl of vanilla ice cream or on top of homemade strawberry waffles. You can also eat it on a danish, a coffee cake, or on top of cheesecake. See what I mean? There are so many ways to eat it! Of course, my favorite way was with a spoon. 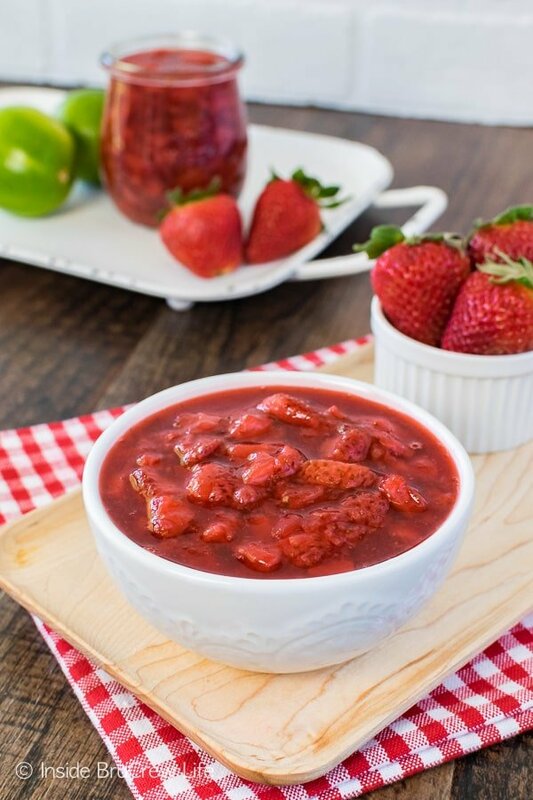 After you refrigerate the mixture, the honey and lime flavors blend with the strawberries to create a silky smooth berry sauce that is so good! Trust me and go with the spoon. 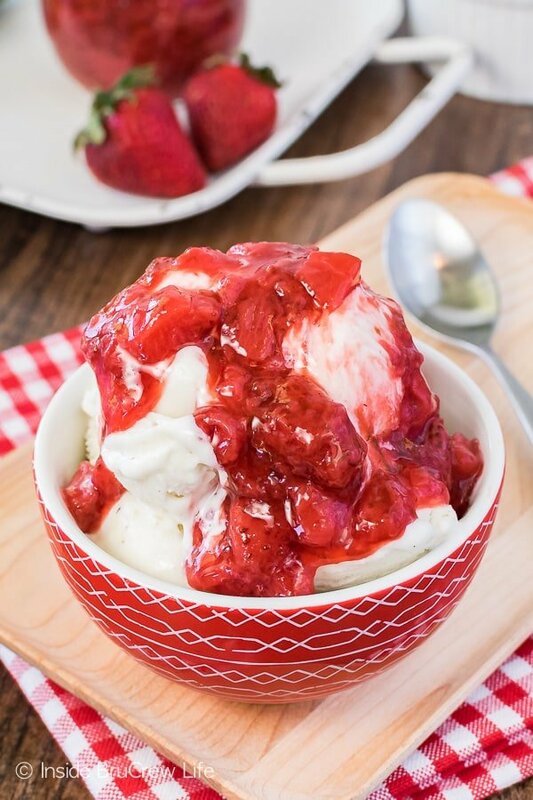 If you make a big batch of this strawberry sauce you can also use it on some other desserts. 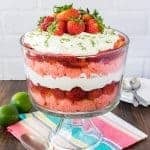 It would be so good on top of this Strawberry Pretzel Salad Dip or on top of this Strawberries and Cream Cake. Or just pile the fresh berries really high in this Strawberry Crumble Pie. That crunchy crumble topping is calling my name for sure. 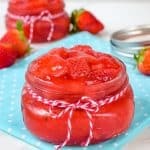 Place the strawberries and water in a saucepan. Heat over medium heat until the berries release their juice. Bring to a boil. Reduce the heat and simmer for 10 minutes until the mixture thickens. Stir in the honey and lime zest. Let cool. Store in a jar in the refrigerator for 1 week. OMG this could go on everything! Well, more things than not. It’s so beautiful too! Awesome inspiration, Jocelyn! This sauce would be perfect on so many things! Love the addition of lime! Making this tonight for Angel food cake. Will let you know how it is liked or not.